Russian president Dmitry Medvedev had a close interaction with the students of IIT-Bombay, speaking about WikiLeaks and democracy as well as India’s aspirations to become a permanent member of the U N Security Council. 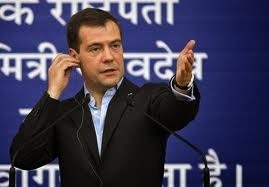 Replying to a question from an IIT student, Medvedev, who was dressed casually in an open-neck shirt and jacket, said diplomacy was essentially a “quite activity” and the secret diplomatic cables published by the website could damage relations between countries. “I see that it has pluses and minuses. May be all the issues discussed by diplomats should not be made public quickly,” Medvedev said in Russian, which was translated in English by an interpreter. Medvedev was condescending when he said the WikiLeaks would cause no harm to his country. Asking diplomats to be cautious about using words, the Russian leader said those engaged in diplomatic activity should realize that sooner or later, their correspondence in the form of cables or letters would become public. For Medvedev, the visit to IIT Bombay was rekindling old relationship between the two countries. It was the former Soviet Union, the predecessor state of Russia, which helped India set up this institution in the 1950s. It was half a century ago that Soviet leader Leonid Brezhnev planted a sapling on the campus grounds, before becoming the head of the Soviet Union. “Doubtless the ties that were established back in the 1950s have not disappeared. They used to be stronger," Medvedev said. The hour-long interaction was held at the IIT’s newly constructed Convention Centre, where around 200 students and about 75 faculty members were present. Source: Dec 22, 2010, Deccan Herald.